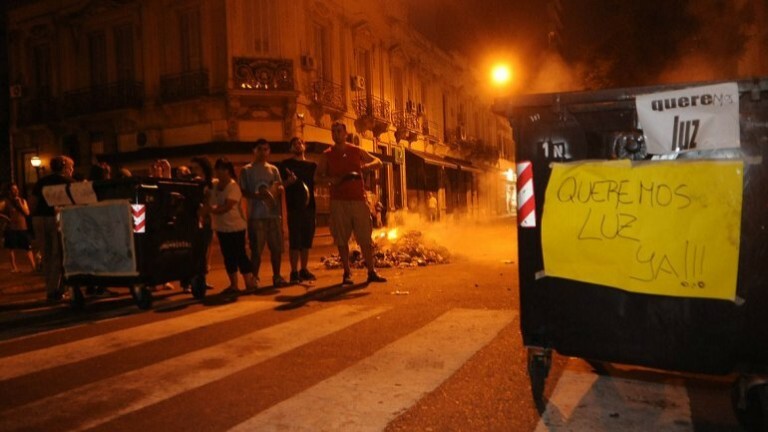 Power cuts in Buenos Aires City and in the Province of Buenos Aires are consequence of the looting of public services at the hands of private companies which act without any kind of control, and are protected by the State, their corrupt associate. 1. Power cuts do not happen because people use too much energy. They happen because companies do not invest in the required facilities to withstand the current levels of consumption. 2. There’s not enough staff because companies have fewer employees per user than those required to provide a good service. 3. Outsourcing provides electricity companies with more workers from “commercial employees” and UOCRA, than from Luz y Fuerza, which generates larger profits for companies but makes them more inefficient. 4. If private companies make more money for their shareholders, but do not invest in modern facilities, appropriate for current levels of consumption and, plus, they act without control and have very few workers per user and not enough employees according to the collective agreement of Luz y Fuerza, then, what do we want them for? With gas happens the exact same thing. – Non-compliances must be denounced. Concessions must end. – It is important to recover public services’ sovereignty and also integrate the whole extraction and fuels refining system with the systems of generation, transportation and electric distribution of energy. And also the gas transportation and distribution systems. – Enough with the looting tolerated and protected by the State. – If you eliminate the profit rates for oil companies, as well as for refining, transportation and distribution companies, and work at local costs, then there’s no need to raise tariffs in order to have good public services. Also, it is necessary to carry out audits of concessions, as well as to judge those who defrauded the people by allowing and carrying out the looting of public services.